1. Preheat the oven to 180°C, gas mark 4 and line the base and sides of a 20cm x 25-30cm tin. Crush the biscuits to a powder using a food processor or by placing them into a plastic bag and crushing with a rolling pin. Stir the melted butter into the biscuit crumbs until completely coated. 2. Press the crumbs into the tin, making sure they cover the bottom in an even layer. Use the back of a spoon to press them down firmly. Bake the crust in the oven for 10 minutes whilst you make the filling. 3. Place the condensed milk into a large bowl and add the egg yolks, lime juice and lime zest. Beat using an electric whisk until slightly thickened, then stir in 100ml of the cream. from the oven and chill for at least 30 minutes. 5. Whip the remaining cream into soft peaks and spoon into a piping bag. 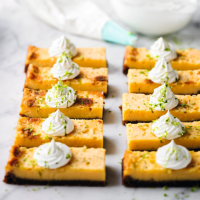 Slice into 20 neat bars and pipe a rosette onto the top of each slice before sprinkling with lime zest.